Imagine racing through the desert at speeds of over 100 mph with 850 horsepower underneath your hood and you hit a slope and now you are flying 15 feet through the air to your doom, but you survive. Not only do you keep driving, but the vehicle you are driving is unscathed. According to Mark Weyhrich, a driver in the Best in the Desert Vegas to Reno Race, this has happened to him. How can this be? 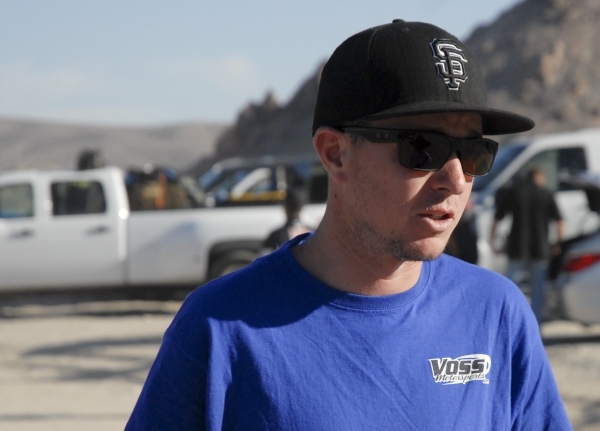 The answer is you’re driving the latest Trick Truck in the Vegas to Reno Race. The Trick Truck is one of the premiere vehicles featured in the race that will start on Aug. 14 in the early morning hours in Beatty. The race is 545 miles long and is the longest off-road race in the United States, ending in Reno. The Trick Truck class is an unlimited class that came to off-road racing in 1994 when Short Course Off Road Enterprises International off-road racing started the class. In SCORE, these trucks are called Trophy Trucks and they are known as Trick Trucks in Best in the Desert events. Whatever you call them, these vehicles are nothing short of awesome. 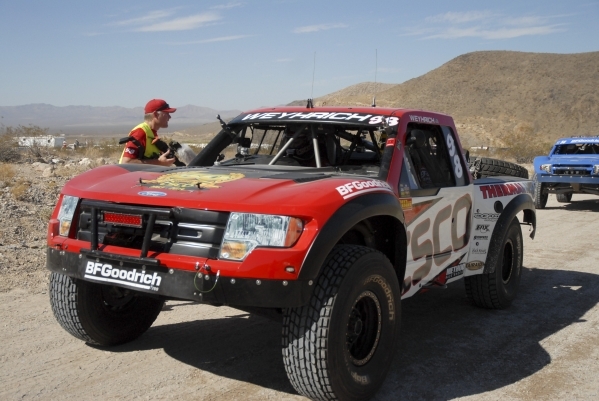 The trucks have evolved into one of the fastest vehicles in Best in the Desert racing. They are only matched by the unlimited buggy class. According to Kevin Mahan, the president of HM Racing, at first, since the class is unlimited, a variety of platforms were developed and it was a free-for-all to see who came out with the best design. Oftentimes in the earlier days of the Trophy Trucks, there were no two designs alike and you often had one-of-a-kind creations in the races. This meant in the early days of Trick Trucks, that designers could spend millions developing these trucks. “People pushed the envelope back then to see who could come up with the best,” he said. Mahan’s company develops and designs off-road racing vehicles and are currently trying to get back into racing Trick Trucks in either through SCORE or Best in the Desert. For about 10 years that’s what designers of the Trick Truck class did but then after a decade the economy soured and the money began to dry up. Racers were not willing to spend millions on new designs that were not proven and so they tended to stick with the top designers. Mahan said the designers of racing vehicles are now into refining platforms that have proven they can win. The Trick Trucks in the field today all have a similar look now. The three top companies now making Trick Trucks, depending on who you talk to, are Geiser Brothers Racing, Jimco Racing and Racing Engineering. The stable platforms have driven the price for a Trick Truck down to around half a million dollars without modifications. Not cheap, and not just anyone can go and buy one. The Trick Trucks have evolved into Chromoly tube-frame chassis construction. The weight in this class is now from 5,000 to 7,500 pounds. The horsepower ranges from 500 to 850. Mahan said at first weight reduction was important, but designers have found that a good solid weight has the vehicle absorbing the blows and not bouncing off of them. Add the fact that the shocks have a good three feet of travel and you have one stable platform. This conversation can’t be complete without mentioning Ford. If one is going to talk about the development of the Trick Truck, Ford has to be mentioned. Ford is one of the only big auto manufacturers who has not abandoned off-road racing said Mahan. Toyota also played a big role, but now Ford is pretty much alone. In 2010, Ford introduced the F-150 Raptor to the public, which was developed through off-road racing. According to Four Wheeler Network, an online magazine, Ford continues to test its latest technology under brutal off-road conditions. They use the data collected from the race to improve their line of trucks. The Ford EcoBoost engine was also a product of off-road testing. It proved a fuel-efficient engine can also have power. Spokesman for Best in the Desert Russ Turner said there are less big automobile companies involved in off-road racing because they don’t see the dividends from pouring money into off-road racing, but Ford has. Ford continues to push the envelope and use off-road testing to stress test new technologies. Turner said a lot of money went into developing high-end shocks and this allowed racers to go faster in the desert. Companies continue to learn a lot from stress testing their products, whether they are big companies or small. Does Mahan’s company produce a Trick Truck? The answer is yes, in a roundabout way. Mahan wants to win in the 6100 class so that it will showcase their work and will use this success there to return to the Trick Truck class. The 6100 is, for all intents and purposes, a Trick Truck but it is a limited class. HM Racing didn’t race in the Best in the Desert this year, but hopes to come back to it in 2016 at Henderson. Mahan said they have used off-road racing to test all of their racing products and to be successful in off-road racing means more sales. Mahan’s company enjoyed some brief success in the Trick Truck class in 2006 and 2007. The best the company did was a fourth place in the Best in the Desert series. Finding a proven racer will be a process for this racing team. “You can have the best widget in the field, but without a good driver you won’t win,” Mahan said. The competition is tough. Jimco will return with two-time winner of the Vegas to Reno Race, Jason Voss, who will be going for his third win. Turner said the race can be won by anyone because it is a highly competitive field in the Trick Trucks. Other racers to watch are Gary Weyhrich, Justin Lofton and even Troy Herbst. All of these drivers came in the top 10 last year at this race. The race is a big economic boon to Nye County. Towns like Beatty and Tonopah will feel a huge boost to their economies as the race passes through or near them. 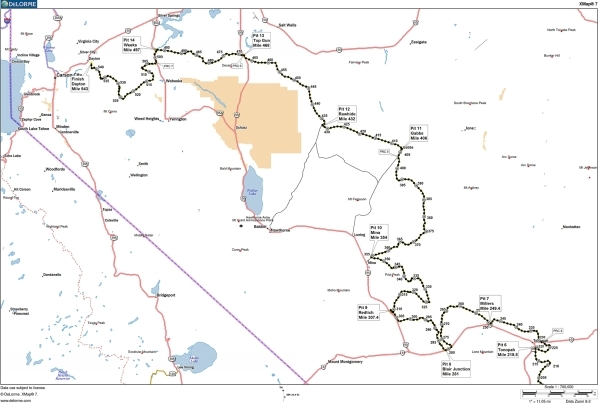 The course will have the racers starting in Beatty and passing near Tonopah. We will know more on Aug. 13 when Folks plans on making a big announcement for Pahrump.